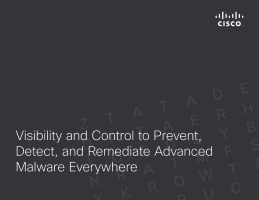 To effectively protect against today’s advanced threats, you need a solution that covers multiple attack vectors, shares information, reduces complexity, and ultimately, provides your organization with deep visibility and control. Not only do you need these to prevent breaches, but in the case that malware gets in, you need the ability to quickly detect, contain, and remediate it. Hacking is an industry powered by a community of professional, entrepreneurial, and resourceful cybercriminals. They share techniques, are well-funded, and work together to accomplish their objectives. Persistent and relentless, they launch mechanized, multifaceted attacks through multiple attack vectors against specific organizations. malware, is very good at masking itself and evading traditional security tools, which can lead to a breach.